The US market is marginally higher on the week. Weakness emanating from last week’s stock report has been countered by short covering driven by weather concerns. The slow export pace does increase the likelihood of USDA raising US ending stocks next week, but declining soft red winter crop ratings and continued concerns over weather/spring sowing delays have encouraged funds to trim their exposure. However, reports from Canada suggest more spring wheat could be sown due to the dispute with China over canola shipments, providing some resistance to further market gains. European prices have been mixed over the past week, with old crop higher and new crop lower. Firmer cash premiums, driven mainly by logistical issues and a further heavy shipping line-up in France, have supported old crop. The prospect of a rebound in 2019 EU soft wheat production and a rise in the euro to a four-week high against the US dollar contributed to weaker new crop markets. UK prices have shown little change on the week, with both old and new crop values virtually unchanged. Market dynamics remain lacklustre as the whole trade seems to be waiting for a conclusion to Brexit. The ongoing debate triggered a small weekly gain in sterling as currency markets seemingly liked the prospects of an extension or a deal as the next move for the UK government. In summary, global markets have edged higher, although the US/China trade talks still remain the major unknown. The weather has, and will increasingly have, a major say in short-term price direction. However, on the flip-side, demand and exports continue to drag and the prospect for a rebound in global wheat production in 2019 remains intact. The EU market has firmed this week on lack of farm selling and slight concerns over the dry weather. In the UK, the firmer currency has meant that the market is relatively unchanged on the week. Buying interest is limited although there is some interest in Craft winter malting barley for both this year and crop 2020.
CBOT Soybeans found support earlier this week on continued optimism that a US/China trade agreement may soon be finalised. However, the trade has since avoided further speculation and awaits an official/definitive announcement. China continued to purchase US origin soybeans, 820,000t this week, despite Brazilian being the cheaper supplier. Exports to China remain approximately 12mln t down year on year. Favourable weather across South America allows harvest to advance and crop estimates for Argentina are likely to increase when more yield information is available. Harvest in Brazil is approximately 75% complete. Trend yields are predicted to be higher than expected, ranging between 115-118mln t (116.5mmt last year). US weather remains a concern. Localised flooding continues with rain spreading across the eastern part of the country. Farmers are likely to switch from planting corn to soybeans. Elsewhere, quality/political issues between Canada and China remain unresolved. This is now having a knock-on effect for next season with some Canadian traders estimating a 10% fall in canola plantings for the 2019/20 season. Closer to home, European rapeseed prices broke through the nearby €360 resistance level earlier in the week. Vegetable oil prices were firmer on the week, Malaysian palm oil firms 4% as a result of increased export demand. Farmer selling is slow. 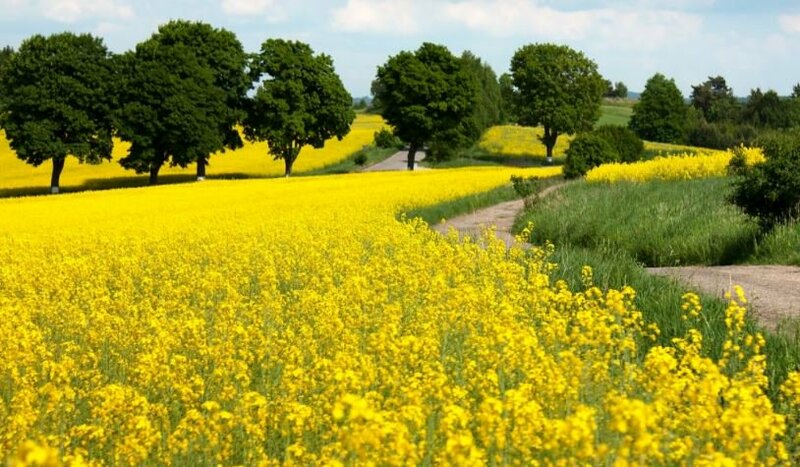 EU rapeseed prices need to stay competitive in order to attract impending Canadian imports, depending on sustainability certificates. Crush margins stay unchanged – new oil business is hard to place. Increased imports and continued downtime at one European crush due to salmonella cleaning is increasing the EU carryout. However, new crop supplies remain tight. Strategie Grains reduced its estimate of EU plantings by 90,000ha to 5.84mln ha, the lowest level since 2011. Here in the UK, rapeseed prices continue to trade within a narrow range, with any increases in European prices being negated by firmer sterling. Larger EU and UK ending stocks are likely to weigh on the market at some point, however with Brexit still unresolved, sterling is likely to remain volatile for the foreseeable future. This will be the main catalyst for price direction going forward. The old crop market appears to be running out of momentum, with only small parcels coming into the market to be sold. Prices remain largely unchanged for good quality milling oats; however, it is becoming increasingly difficult to place parcels of lower quality oats as demand is low. On the whole, the winter crop in the ground is looking well and spring drilling has continued apace. Indicative new crop values are a hefty discount to old crop (circa £50), as traders and consumers anticipate a better-quality year both domestically and globally than we have seen in the 18/19 harvest. With the bulk of the broad-acre crops now drilled, we are getting into the window for establishing game covers, grass leys, environmental mixtures, wild bird seeds and cover crops. Please call your farm trader or one of our seed specialists for more details on 01427 421 217. ADM Agriculture has an excellent portfolio of OSR varieties ahead of the autumn to offer with attractive early order payment terms to reward early commitment. Hybrid barleys now account for a significant area of the total winter barley crop, and the pace of development of these high output varieties is not slowing up. SY Baracooda is the latest offering from Syngenta’s Hyvido breeding programme, which combines the highest untreated yield and joint highest treated, along with an excellent agronomic package to make this the leading hybrid variety for the coming season. Most recent trades of granular urea were at $252-254/t FOB Egypt, sold to an undisclosed buyer in Europe. This further supported stable urea prices throughout April. The current cold, damp snap and comparative value to ammonium nitrate has seen some farmers use urea for their second applications. ADM Agriculture can deliver granular urea promptly – please contact your local ADM Agriculture farm trader or the fertiliser desk on 01427 421237. In the UK, price direction for May and new season, will come from the on-going Indian tender, and events that impact on currency will be a key driver for future price direction. Second applications are well underway. Nitram, in most cases, is priced competitively vs imported ammonium nitrate, and some farmers are switching from imported product to use UK produced ammonium nitrate. Blue Bag product, for both top-up tonnage and entire second application requirements, is guaranteed quality, and deliveries are prompt into most areas. CF also have nitrogen-sulphur product SingleTop (27N 12 So3), which continues to sell at its corrected price. Grassland farmers looking to fulfil their second cut applications of nitrogen and nitrogen sulphur can enquire through the fertiliser desk or their ADM Agriculture farm trader. CF terms can be withdrawn at any time.